“And there were shepherds living out in the fields nearby, keeping watch over their flocks at night. An angel of the Lord appeared to them, and the glory of the Lord shone around them, and they were terrified. But the angel said to them, “Do not be afraid. I bring you good news of great joy that will be for all people. Today in the town of David a Savior has been born to you; He is Christ, the Lord. This will be a sign to you: You will find a baby wrapped in cloths and lying in a manger. You will find Him in a feeding trough. You, on whom His favor rests. You will find Him where you least expect Him. This, the very most unexpected place, this is where we find Him. Even more, this is where He finds us. In the long dark nights, in the lowering of my friends’ bodies into the dark earth, in the resettling of their children into foster-families, in the impossibly hard parenting and the shepherding of my children through searing loss, I have known Jesus. In the endless blending and grinding of food for a feeding tube, and the endless chopping of carrots for soup, and the long lists of spelling words and multiplication facts, and the unexpected joy of just being, we have known Jesus. In the blazing hot sun, in the forever-caked-on-my-heels red mud, over the thousands of potholes, I have known impossible, unexpected Grace. And this is my prayer for you this Christmas. That in the very most unlikely places, in the hard and the hurt and the dark, you would know the unexpected hope that can only come from our Savior. Impossible grace abounds, even where we least expect it. Merry Christmas. May impossible, unexpected grace be yours through Christ our Savior. Katie, I read your book and fell in love with the story God is writing in your life. You are such and inspiration and encouragement to me in my walk with the Lord. I pray you have a great Christmas with your girls! God must have told you some of us needed to hear these words tonight. Thank you! I am a fairly new reader to your blog and am humbled by your courage and testimony! I can't wait to purchase and read your book! My family is in pain right now emotionally. It is making the holiday very difficult-even though I am a Christian. My brother is in the throes of an alcohol addiction. They just had their first child this past March. The baby is precious, loved and not neglected or abused but I know the environment is dysfunctional and unhealthy. Please pray for them if you think of it. Thank you and Merry Christmas to you and your precious family! I love that once again we area reminded that we can see/be with Christ anywhere! How amazing that God chose our perfect savior to be born in a stinky, mess so that we could be forgiven of our stinky messy lives. I will read your blog entry to my family before we open our Christmas gifts. Thanks you for being an inspirational gift to me! Thank you for writing this blog and for writing your wonderful book! You present your life in a raw, God-glorifying manner and with a humble heart. He has you just in the right spot and though you only can see a tiny part of his plan, keep trusting Him! Know that a girl in Australia prays for you and Uganda each night, thanking God and asking Him to keep showing you His glory and his heart of love and mercy. Merry Christmas!!! Much love to your beautiful family. Thank you for these amazing words. Katie, really love reading your blogs. Thanks for the encouraging truth this morning. I am a fellow missionary in Zambia, waiting to adopt two boys into our family here. I have enjoyed watching your girls grow over the years. God bless you and Merry Christmas! Merry Christmas to your sweet, beautiful family! Your family is so beautiful! Merry Christmas! Merry Christmas! Your daughters are beautiful! Hi Katie! I received your book as a Christmas gift from my younger sister. I am 17 and while I've never been there, God has given me a love and passion for the people of Cambodia. Thank you for writing this book. It has already made a difference for me! Merry Christmas to you and your girls! I am just about finished reading your book, and boy was it humbling! I am a teacher in upstate NY and am constantly trying to think of ways to help children more. Thank you for giving me a way. I would like to send a care package of supplies such as clothes, and other necessities. I would also really love to volunteer, come to Uganda, and see what I can do to help. If you would please email me at kmb05486@sjfc.edu so we can discuss this further, I'd appreciate it. Katie, your words always touch me in a way I can't really express. I have surrendered to go to the people of Liberia. I am raising funds to go as we speak. I just can't wait to get there! Thank you for being such an inspiration and a source of hope to me. Dear Katie, your words have always touched my heart in a way I can't express. I have surrendered to go to the people of Liberia. I am raising funds and can not wait to get there. My prayer is to model my ministry after what you have accomplished. Thank you for being such a source of encouragement and hope for me personally! God bless you. Katie, you and your family are beautiful..in a Godly way! Glory to God, for all the things He has done! I am so glad He found me. Thank you for being His instrument, and being a light. Strong testimonies and humility are true Christmas gifts, as are the radiant smiles of His children. Praise to the Birthday Boy who saved our lives. Merry Christmas to you and your family, Katie! You are all radiant! Thank you as always for your inspiring words. I pray you and your girls had a blessed and beautiful Christmas!!! I pray that Christ covers you and your girls with peace and joy throughout the coming seasons! God bless you all! And know, I'll be praying for you!!! May our Lord Jesus be your Rearguard and your Leader now and forevermore. As always perfect words from our Savior through you at the time when I most needed them. Thank You! I hope that your Christmas with your girls was wonderful. Merry Christmas, Katie, to you and your girls!! I hope your Christmas was wonderful. Happy New Year to you and your sweet girls! Dear Katie, I love your words of wisdom! What a beautiful heart you have, and I want to be like you! Thank you, and blessings to you and your girls. Love YOU! Blessings to you dear family...lifting you in prayer. May your new year be overflowing with Grace!!!! I am mid chapter 12 and my heart unexplainably aches to serve the right Lord of my life. The one who was born in a manger. Girls, I am so excited that you know God and are his hands and feet. Bless your family Miss Katie, and I am so proud to serve the almighty God along side you. I believe we are serving and listening to Him where we are today but I would follow him wherever he leads me to and through. Hi, Katie, my name is Emily and I am twelve years old. I live in Georgia and recently got your book as a Christmas present and fell in love with it. :) I love your blog and so far, even only in the 2nd chapter, your book made me cry. :) Merry Christmas! Nice reflection on the Christmas message, Katie. It's interesting that when we become Christians, we switch roles, so to speak. It's not Christ in the manger, but us. And it's His tender hand that reaches for us and lifts us up. My question is, are you/have you considered writing another book about your continuing story? Merry Christmas to you and your beautiful family. All of you are an inspiration. May God continue to bless you, as your life blesses Him. Your life blesses Him by giving Him glory in all that you do. Thank you. I am reading your book that many people at my church have recommended for me to read. One of our pastors have said I remind them of you. God has placed on my heart to go and love and tell children of God's word I am only thirteen but I know when I'm older God wants me to tell people about him. I love your book . One of the pastors at my church recommended it for me to read they said I reminded them of you . God has put on my heart for me to love and teach children about him when I was seven now I'm thirteen and cannot wait to see what God has planned for me. Even though the only way I know you through your book and blog I look up to you knowing your following what God wants you to do. Beautiful family, beautiful life story! I love this. You so perfectly put into words what was impressed on my heart this season. Thank you, and God bless you richly this year! Hi Katie! I've been following your blog for a while now and just finished your book. Your girls are absolutely beautiful and I loved reading about each one of them. Could you somehow point out each one in your family picture with her name? That'd be awesome! Hi Katie!! My name is Matisse, I own a copy of your book 'Kisses from Katie.' I received it as a present, and me being a book lover, your book was one of the best books I've ever read. I, myself have been to Cambodia, Malaysia and Vietnam twice on missions trips and it was outstanding. I loved interacting with the kids and just providing love for them in the 2 months we were over there. Though i wasn't there for very long and never did what you did, i feel your book captures perfectly what it feels like to live in a place like Uganda. you are so inspiring and a true and loving person, with a heart from god. I am truly honoured to have read your book and know your story. Your relying and trusting relationship with god is the one i want in my life and i will work hard to get it. God certainly chose the right person for the job Katie, i haven't met you but i know that he is so proud of you, and your success. Starting Amazima and adopting girls in a different, is truly showing your love for god. I was so inspired by your book Katie. Keep doing what you do and loving those children with all your heart. Merry Christmas, and have a Happy New Year!! Love your book, and all your work in Uganda!!! Katie and family: Merry Christmas! I received your book as a gift Christmas day and am on the last chapter. God has brought me further in my faith through you sharing your experiences. I have laughed, and cried and shared your stories with others. I have been praying that the Father would show me how I may be of service and hoping that he may lead me your direction. can you tell me if there are any volunteer opportunities with your organization? may God continue to bless you and the service you do for others whom he places before you. thank you for sharing Katie. this story has blessed my life, glory to God! Katie and family: Merry Christmas! I received your book as a gift Christmas day and now am on the last chapter. God has used your story to bring me further in my faith. I have been praying that he show me how I may be of service to his loved ones and hoping that he leads me your way. are there volunteer opportunities with your organization? May God continue to bless you all and all those he places before you. glory to God in the highest and on earth peace and goodwill toward men. I'm impressed by many things in your life - one of them is all the hair you take care of! Stay strong and may God Bless you in the new year! Katie, You are such an inspiration of Christ like love. God recently put it on our hearts to bring in a foster boy who's mom passed away. We had just finished raising our Brady Bunch Family (6 kids-5 boys, 1 girl) when I received an email that tore at my heart. We prayed and prayed, Your Will not our's Lord. He began to move and we took huge steps of faith. God is so faithful and I pray that you and your family will continue to grow stronger in and through Him as He moves the mountains. Continue to shine the light of Christ into all you come in contact with. When people get just a glimpse of true Christ-like love…their life is changed forever! God bless you all, Merry Christmas & Happy New Year! Katie!! I am reading your book (after being encouraged to by several friends) and I am sooo encouraged and motivated by your testimony!!! I was thrilled to find that your passion for Christ far exceeded your desire to be a part of the cultural norm!! This is my prayer too and I admire your example so much!!! Lots of prayers going your way!! We serve such an awesome God and He is using you in an incredible way!! 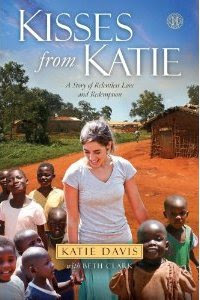 Katie, I am reading your book having already fallen deeply in love with Africa. (I've been to South Africa every year since 2010.) And Kisses from Katie has caused me to fall even more in love with the continent. What the Lord is doing in you is beautiful. You are gorgeous from the inside out. Love and prayers for you and your precious girls from Dallas, Texas! I have been looking forward to your Christmas Family Photo this year. Thanks for the message was just what I needed. Dear Katie, I am on chapter 7 of the book. Everything I read is a song from my own heart and soul, written there by JEsus. I live in Texas and long to do that which you are doing. It literally takes my heart away and makes me want to jump into the screen when I see the videos of you in Uganda. I am praying that the Lord will show me his path and his way, and lead me to many, many orphans to be a mommy of many! Is there a place on your site that refers to needs your ministry has for workers, volenteers or permanent caretakers for orphans? I am looking into that, my heart is going to burst if I don't get to the orphans soon. :-) thanks. I have just read your book. I honestly cried through the majority of it as I, too, fell in love with Uganda. I went for the first time in 1/2013 and an coming back in just 17 days. Reading your story reminded me of God's amazing plan for each of us on matter how crazy it seems. Thank you for sharing. Thank you for the idea that Baby Jesus was found in an unlikely spot-- a feeding trough. That is beautiful. It supports His teachings that He is the Bread and Water. As I partake of Him through reading His word and serving His children I am nourished spiritually. Daily. Hourly. Moment to moment. what a blessing you are Katie. Your book is amazing. I've read it but now I'm ordering it and cant wait til i receive it. I would really like to exchange inbound links by using your website is this doable?I will increase this website to help my favorite features, it is superb. Hi I know it's probably odd for you to get a friend request from a random stranger. Well then again with your book it nay not be. I just wanted to explain myself. My name is elly Carlson. I'm 15 years old from Virginia. On new years eve my church had a lock in and my youth pastor did a sermon on Hebrews 3:13 but encourage one another daily, as long as it is called today, so that none of you may be hardened by sins deceitfulness. Then my youth pastor transitioned into a song by Mathew west called do something. If you haven't heard it I recommend looking it up. But the song really touched me. And I want to do something. I really feel called and led to do gods work for the rest of my life. I don't know in what way yet but I'll find out. I told my youth pastor this and she gave me your book and told me it was deeply inspiring and that I should read it. I'm only at the begining of chapter 4 and I know I need to be reading it. I feel like God knew I would finally hear him calling to me and that he somehow got me your book. I love it. I want to go to Uganda. I want to help as much as I can. I truly feel led by Christ to make the difference I can in one life at a time. Sharing the best and greatest gift of all. His love. I even talked to my dad about going. Not deeply but he said if I really want to go and I do the research an provide all the info he'd come with me like you and your mom did. So I just wanted to say thank you for all that you have done and I know you will do. And I wanted you to know that you work is effecting people here you don't even know. Thank you so much. Hi I know it's probably odd for you to get a friend request from a random stranger. Well then again with your book it nay not be. I just wanted to explain myself. My name is elly. On new years eve my church had a lock in and my youth pastor did a sermon on Hebrews 3:13 but encourage one another daily, as long as it is called today, so that none of you may be hardened by sins deceitfulness. Then my youth pastor transitioned into a song by Mathew west called do something. If you haven't heard it I recommend looking it up. But the song really touched me. And I want to do something. I really feel called and led to do gods work for the rest of my life. I don't know in what way yet but I'll find out. I told my youth pastor this and she gave me your book and told me it was deeply inspiring and that I should read it. I'm only at the begining of chapter 4 and I know I need to be reading it. I feel like God knew I would finally hear him calling to me and that he somehow got me your book. I love it. I want to go to Uganda. I want to help as much as I can. I truly feel led by Christ to make the difference I can in one life at a time. Sharing the best and greatest gift of all. His love. I even talked to my dad about going. Not deeply but he said if I really want to go and I do the research an provide all the info he'd come with me like you and your mom did. So I just wanted to say thank you for all that you have done and I know you will do. And I wanted you to know that you work is effecting people here you don't even know. Thank you so much. Katie, I started reading your book today. I'm at the third chapter and already I've cried like a baby more times than I can count. Katie you are so inspirational! I'm 13 and a christian and I want to do something about the lost in my town. Please when you read this take just even a second to pray for me and know that I am always praying for you. Psalms 126:5 - They that sow in tears shall reap in joy. I want to thank God for using your life, Miss Katie Davis, to touch me. And I want to thank you for having the faith and courage to share your joys and sorrows with us. I felt compelled to share how your ministry and testimony have touched my life. So here we go. . .
For many years I had lived my life according to the do not’s of the Bible. I didn’t drink. I didn’t cuss. I didn’t smoke. I didn’t use the Lord’s name in vain. I thought of myself as a ‘good person’ because I abstained from sin. Oh how Satan can capture us with complacency and false contentment! I had not felt the presence of God in so long that my heart had become hardened and calloused. When surrounded with such an abundance of material ‘stuff’ here in the U.S., I had become dependent on the things of this world rather than those of the Kingdom of the Lord. I was just going through the motions. God has since opened my eyes to His will by the conviction your life story has brought upon me. I realized that, even though I didn’t commit the obvious sins, I also didn’t care for others, didn’t give freely from my heart, didn’t love others as He has loved me, and didn’t seek to be self-denying and Christ exalting. I had gotten so caught up in the do not’s of God’s Word that I had neglected the do’s of it. So how can we know God’s will for our lives? We must put him absolutely first. So many of us (including myself) have turned this verse around in our lives. We pursue the cares of this world. Then, once attaining ‘our’ goals and/or careers, we say “Here am I God”. He wants our first works, not our spare time. Also, we MUST STUDY, trust, and APPLY ALL of God’s Words to our day to day lives. Matthew 4:4 - But he answered and said, It is written, Man shall not live by bread alone, but by every word that proceedeth out of the mouth of God. Let me say, I have read the Bible, laboriously, for YEARS. And I will admit, it became absolutely boring and unfruitful to me. This is what happens when we ‘read’ it only. You must ‘STUDY to show thyself approved’. Once I began to study his Word, and more importantly, APPLY it to my life, the pages began to come alive as Christ convicted my heart. Psalms 119:105 - NUN. Thy word [is] a lamp unto my feet, and a light unto my path. We are to walk according to the light given by the Word. LIVE IT!!!! I knew I could at any time go to my refrigerator and satisfy my hunger VERSUS not knowing if and when my next meal would be. I had a cushy, engineering job to attend where I received a paycheck that is abundantly above and beyond the cost of my needs VERSUS laboriously digging for scrap metal in bare feet all hours of the day to make enough money for a tiny bit of food. I went home to an air conditioned house, clean running water, and a soft bed at night VERSUS returning to a cramped shack or perhaps a card board box in sweltering heat to sleep on the floor in the midst of malaria infected mosquitoes. I had money and access to purchase any medicine to fight any sickness that might come upon me due to a malnourished immune system VERSUS living among widespread diseases and no way to attain a cure for them. The most important difference, however, is that I have been blessed by knowing God, His Son, His Spirit, and His Word. I have received salvation through Jesus Christ. When I was hungry, I had a loving Father that I knew could handle any hardship that might come my way. I love how Bro. Adrian Rogers once stated, “Jesus did not come to get us out of trouble, but to get in trouble with us.” God has always been there for me, even when I so miserably fail Him. I know Heaven is in my future . . . VERSUS living in a world of brokenness and suffering, surrounded by and being on the verge of death at all times and not knowing what the future holds, who Christ is, or the love and hope that is in Him. So often we look down on the people of this world who turn to paganism and worshiping false gods. We turn up our noses at them as being heathen and trash. I, now, can fully understand why these people are turning to these snares of Satan. It is called desperation. If I had been in the state these people are in, I too would place my hope in anything that might claim to help me. Unlike the majority of Americans, these people are LOOKING for salvation. They desire it! They NEED something above the brokenness and suffering of this world in which to place their hope! That is why it is so important that the Gospel of Jesus Christ be spread to them. Their hearts are receptive to it! If they can but only hear of the wonderful gift of salvation and hope of our Lord Jesus Christ! As I ended my fasting, I looked at the abundance of worldly goods that surround me. Things to accommodate so many ‘wants’ as compared to very few ‘needs’. I could not but feel guilty, thinking of the toys I have, of my fat bank account that I have been clinging to. Why? So that I can buy more toys to distract and distance me from God’s will for my life? Or so that I can retire at an earlier age? Why do we work toward quitting? Do we not realize the next event in our lives following retirement will be death? I want to continue to work for Christ. Jesus instructed us to pray ‘Give us this day our daily bread’. That is all I ask for. Just enough for today. Let the rest be offered to God and my future placed in His hands. The Christians of this country seem to think they’re not called to do anything for Christ beyond attending church on Sunday. That is exactly what Satan wants us to think! Instead, we are to continually LABOR for the cause of Christ! I want to encourage my brothers and sisters in Christ to find a ministry (such as Amazima!!) that is, first and foremost, dedicated to the spreading of the Gospel of Christ, and also to showing his love for others. Then support them, both with prayers and with the finances God has ENTRUSTED to us. Haggai 2:8 - The silver [is] mine, and the gold [is] mine, saith the LORD of hosts. The wealth we have been given is all His anyways! I apologize for the length of this ‘comment’. I have never blogged before. I don’t even have a Facebook, but after the drastic change in my life, I couldn’t help but share it. I pray that others who are touched by the work God has done through Katie’s life will act on the convictions God places upon them as he did on me. Let it not just be a ‘spiritual hick-up’ but a life changing experience for the glory of God. Your life, testimony, and ministry are being used by Christ for reaching and touching the lives of so many more than you know, Miss Katie. So from a brother in Christ, one of the many touched lives, and a 26 year old fellow Tennessean, I sincerely thank you. I hope this will be an encouragement to you and your family. May God continue to use you for the cause of Christ and bless you all abundantly. Hi Katie, I just finished reading your book, and really love everything you are doing with Amazima. God bless! Hi Katie, I just finished reading your book, and am so amazed at what God is doing through you! God bless. I am so touched from your story which I just came across on faithit and then began looking more at your life and ministry on other pages. I will keep it short as I prayerfully ask this "How can I get involved in your ministry, I want to come to Uganda?" I have just graduated from Theology College in Belfast, Northern Ireland, too. Mother Teresa's mother was born in my home city Gjakova, Kosovo. You are such an inspiration. I know you must hear that quite often but let me tell you just how true that is for me. I have been a preschool teacher off/on for several years. Recently I've been struggling with whether to return to that job or take another one. Then I found your story. I've heard at least a 1,000 times that I have a gift for challenging children. I had a child who could barely talk but as my student he blossomed into an amazing (and talkative) little man. I had another child who was ADHD but as my student, I managed to make him more focused and engaged. I know teaching is what I am meant to do and your story reminded me of that. God bless you and thank you for being such a wonderful soul and for sharing your incredible gift with those children. So just out of shear curiosity I typed this into Google... "How to find meaning in life" I kid you not there was a wikihow link that came up with the 8 steps to have a meaning life (with pictures). I don't know what that shocked me but it did. Do people really think they can find meaning in life through Google? Is that what our generation was come to? You're probably thinking well you Googled it so why can't other people. I Googled it just to see what would pop up though not because I was actually looking for an answer. What brought up this whole thought process was because I took my adderall this morning and got a ton of work done and then got bored. My boredom normally leads me to websites like distractify.com, elitedaily.com and faithit.com. Today it was a faithit.com kind of day. I'm not a very religious person (I'd say more spiritual) but I love this website because if you ever find yourself losing faith in humanity the stories on that site will restore it. I will warn you though you might want to have some tissues near by because a lot of the stories will bring you to tears, happy tears but still tears. This afternoon I came across a 4 min video of a 21 year old girl from Tennessee who went to Uganda right after high school to do some mission work for several months. She was suppose to return home but ended up staying and starting Amazima Ministries International. This girl is just a few years younger then me and today she inspired me. I was telling someone about the story right after I watched it and they asked me if I would do it I said yes; her next question was you'd give up everything to go help them and again my answer was yes. I live in a major city in the South, I have a cute apartment that I pay to much for but love, I make pretty good money for my age but at the end of the day does any of that matter? No... When I'm 90 years old and look back on my life I probably won't even remember the apartment but what would remember making a difference in someone else's life. I've been to Africa I've seen the conditions these people live in and for them it is normal, for most of our generation they couldn't even fathom no having their iPhone not to mention not having AC, a shower, a bed or even a house tall enough to stand up straight in. I truly think that our generation needs to see something like that first hand because it is a life changing and eye opening experience. We forget that not everyone lives like we do, not everyone gets clean water and a meal everyday. I think what Kate is doing is amazing, she is better these kids life not because someone told her to but because she wanted to. I hope one day I get the opportunity to do something that will make a difference in someone else's life. Below is a link to her blog and I encourage everyone to go look at what she is doing and I hope it touches your heart like it touched mine. This world is a crazy place and sometimes we just need to be reminded that there are still good pure hearts out there. We need to be reminded that not everyone does things for the fame and the fortune some people still do things out of the kindness of their heart. I have no idea if you will see this but I want you to know that I have the utmost respect for you. For someone at the age of 21 to be doing what you are is amazing. I hope that one day I become half the women that you are already. I wish you the best of luck and maybe one day I can come to Uganda and help you. With thanks for writing this website and sharing it using the world. I would like to know ways to go for reading your rss website. Please let me know if probable. I am so completely inspired by your story. I am 22 and quit honestly am living the same way you did when living in the states. Your story has completely changed my way of living and thinking. I have always gone to church and followed the gods word but I as well still tend to complain at times about how horrible my life is because I can't have those designer shoes or that cool expensive car. I realized after hearing your story that god has always given me everything I need and that sometimes it may not be what I want but it's certainly enough to be grateful for. You made me understand the true meaning of selflessness and what it is to truly love for god and him only. I can't tell you how much you are not only changing things in Uganda but you are also changing things here in the states and you are bringing awareness to believers and nonbelievers that god is the answer and that material things are just that. I think through you us young adults here in the states might just be inspired enough to change this generation and to give our lives to god and not to materialism. I think our generation live for materialism way too much because well that what we know but through you and your story were beging to know simplicity and loving god and living completely for god. I admire you and am so thankful you have shared your story, you are going to not just going to be the change Uganda needs but the change our generation needs! You are a blessing from The Lord any so many more ways than I think you truly realize, so thank you so much and god bless! What a joy to see these pictures of your girls! I recently started reading your book and so in my mind they are still so little, when in reality they are stunningly beautiful young women! Thank you for the work you are doing and for sharing your story and the stories of those around you. You and they are truly an inspiration! I am so looking forward to sponsoring and getting involved in Amazima and these beautiful people. You are all in our prayers and I cannot wait to see the continued good work that you do and that God does through you. I just recently began reading your book and so in my mind the girls are all so tiny and young. What a thrill to see your Christmas pictures! What stunningly beautiful young women! I, like everyone else who has become familiar with your story, am so touched by the need in Uganda as well as the work that you are doing and that God is doing through you. I am very excited to become more involved in Amazima and to sponsor a child. Thank you for being willing to answer the call that God put on your heart and for sharing your story. It is truly an inspiration and a message that needs telling! Katie, thank you for writing this blog which I have just discovered after reading your book. What an inspiring beautiful book and love for Our Lord that you have. Please know that I and others will be praying for you and all your beautiful children in Uganda back here in Scotland. I'm a grade 7 student from Ontario, Canada. I read your book and was inspired by it. I am writing my grade 7 original speech on you! I'm a grade 7 student in Ontario, Canada. I read your book and was inspired by it. I am doing my 7 grade original speech on you! Hi Katie! I am reading your book right now, and wonder if my family and I could sponsor a child with whom you are involved? Also, do you ever allow teens from the U.S.A. to stay and serve with you? I have been serving on mission trips to Cuba and Mexico since 2010, and your ministry is one that has touched my heart. Thank you so much and God bless! A friend of mine gave me your book and it has been a source of encouragement. I am currently in the US studying but being far a way from my daughter has been very difficult.Each page I read, I see faith, hope,courage,strength. You are a blessing to many, you are a perfect example of a warrior! Today at church the pastor said, "the day you recognize that you are nothing without God, that's when your glory will come". Your book has shown me what it means to totally surrender everything to God. Thank you for the great work you are doing in Uganda! when I come back home, I'll look for you. God bless you ! I am a 15 year old girl living in Georgia. If only you know how much i get from every single one of your posts. You are remarkable! I just wanted to let you know how inspiring you are to me. I recently spent two weeks in Kenya and then Uganda this past Thanksgiving. I've read your book and I loved every single bit of it. I have felt God pulling me to missions for awhile and you inspired me to even go on that trip. Now I am hopefully returning to Jinja this summer. I hope to be working at Amani Baby Cottage. I'm trying to convince my mom to go with me this time. I want her to see the place that I fell in love with. I am continuously praying for you. Thank you again for everything you do. Katie, you are my inspiration. I have read your book and it inspired me while I went on my first mission trip this past Thanksgiving. I spent two weeks in Kenya and Uganda. I fell in love with Africa. I fell in love with the children. They all were so full of God's wonderful joy. 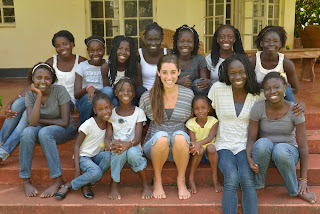 I am hoping to return to Jinja this summer and volunteer at Amani Baby Cottage. I am hoping to bring my mom with me this time to show her the place that I fell in love with. May God bless you with everything you do. Thank you again. Hi Katie! I loved reading your book and blog and I'm keeping you and your lovely girls in my prayers. May this new year bring you joy and peace and the strength to keep doing God's work! Thank you, Katie, for being God's hands and heart for people who are hurting, and for showing the rest of us what it means to look like Christ. You are doing the hardest work on earth with such grace. I read you often; you are such an inspiration. Thank you, Katie, thank you. Katie, I am in the process of reading your book right now. I am currently living in Kenya right now teaching as a student missionary. I just now found your blog. Id like to know more about your life and talk with you when you get the chance. As busy as you are. Thank you for being such an inspiration to me. You encourage me to live radically for Christ everyday. I attend Lipscomb and they communicate the importance of using your gifts to further God's kingdom here on earth. You do such a good job of that. Katie, my passion is helping people and my dream is to move to uganda and teach children, just like you! however I have no idea where to start! I'm unsure of who to contact or talk to, would it be possible if you could help guide me, how did you start? I read your book about a year ago and I want to tell you that you are such an inspiration to me. One day I will be a missionary, though I'm not sure where yet. It is one of my dreams to adopt many children. Your life is so encouraging to me. Thank you for all you have done for the world. I just finished reading your book! WOw! It changed my life! I have 3 boys and so I kno how hectic life can get with 3 but children are such a blessing and fun!! I would love to visit your beautiful family in Uganda and sit at your table and share a meal! I have so much to ask you and talk about and it would just be so much fun to be around all that energy! May God richly bless you everyday, I know He has already cause I see the glow on your face! I want that same joy!! I will pray for you..
do it even more!!!!! i am filled with so much joy!!!! I am a 12 year old girl and my parents are missionaries in Papua New Guinea. Your book really inspires me! I want to be a missionary when I grow up too. Now I want to be one even more! Your story fills me with so much joy!!! Thank you for following God. Dear Katie, I am a 16 year old girl from Missouri. And I just wanted to let you know that you are my hero. I wish that in my next few years, I will accomplish something as incredible as what you did. Katie, I don't know if this will get to you but its crazy how God works .. Last summer on a missions trio to Guatemala I fell and cut my hands slightly and I wanted to wash feet the next day, but my mother wouldn't let me because of diseases. In my mind, I was like but if I am doing the work for God then he will protect me and keep me safe. But my mom rebuked me and told me that there is so much sin and evil in the world that I need to be careful... I have been thinking about it since and it brings me to tears everytime.. But tonight I think you summed it up.. I oped your book and read the introduction and you talked about not worrying about our bodies and that's exactly what I needed to hear and I know God set that up for me.. Its been such a burden and I am now ready to approach my mom to seek out wisdom... Thank you for your work for our God. The work that you do in Uganda is truly encouraging. We do missions in Rwanda. My oldest daughter will be 18 next month and wants to spend some time at the orphanage when she graduates in June. I am excited to see what God has in store for her. We have been twice to Rwanda and it is truly life changing. God is an amazing God and like you, I am thankful that he would chose us to accomplish his will for these precious people. May God continue to bless you, your team, and all the people of Uganda! Words can not describe how much your book has meant to our family! Praying for you, Katie! and increases the power of the weak." Thank You! I Know your Christmas was beautiful because you KNOW Him! Blessings for your new year. I praise Him in the sorrow and muck with you. Sooo glad to call you a sister in Christ! Hey Katie! My name is Benjamin, and I just started reading your book. How can I go on a mission trip there? Thanks so much, Katie, for writing this blog and for writing this book. It has blessed me and others too, and I can't wait to read more of the amazing miracles happening in Uganda. God is awesome and surprising. I just read your book, my goodness! I sent a donation and also, a copy of a fairy tale I wrote years ago, I hope you receive it sometime, you will love it I'm sure. It's about a pious, young girl named Katarine, who loves God more than anything. Katie, my daughter, Laura, is a faithful follower of your story and your blog. She has a wish to go to Uganda and help you one summer. For her 15th birthday this weekend she is having some 13 girls (some from Brentwood!) over for a tea party. Instead of bringing gifts, the girls are bringing their pocket money to send to Amazima. I have waited too late to ask you how, but they would all love to send notes to your girls, as well as a gift. If you see this message and can respond, I'd be grateful. God bless you and lift you up each day, and night! Katie, you're so incredibly inspring. I have just started your book and I feel as though it's changing my perspective on my life and how God is calling me to live it! Thank you for writing it, and sharing you're story. You rock, girl! Keep touching lives in the name of God. I read your book and I think what you are doing is so amazing. I have been to Uganda 4 times and will be going for my 5th time this summer. I have completely and utterly fell in love with the country and the joyous people who live in it. I used to have a in depth plan for my life, once I graduate high school (in June) I would go to college at the University of Washington and then would get a good job where I would be able to travel to countries, like Uganda, and help the people there with whatever profession I chose to do. But I believe God has a different plan for me. I have had a very tough year and have gone through so many struggles which brought me closer to God and helped me listen to Him and I am positive He wants me to go to Uganda and serve Him and the people there next year and hold off on college for a year or maybe more. The only catch is I do not know where he is calling me to go. 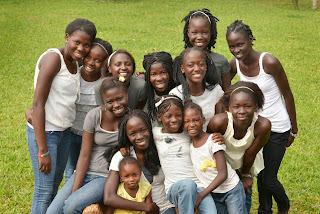 I know many people in Uganda but I do not know where I could stay for a year and build relationships and serve people. I know God will point me in a direction of where he wants me to go in Uganda but I believe he was nudging me to try and contact you. Everything you have done is so incredibly amazing and inspiring and whether you have a word of inspiration or an idea of a place I could stay to serve I would really appreciate it. If you read this, I would love to be able to talk to or email you. Thank you so, so much for taking the time to read this. If you would be able to contact me my Facebook is Isabella Chaffey and my email is bellachaffey@comcast.net. What's up Katie!!! 2014!!!! Yes, I am a little late, but finished the book = ). Hope all is good!!! Was introduced to the book by a friend, Kady Cherry, in 2014 so it's her fault for telling me about it so late!!! I just got in the mail the bracelet from Amazima Ministries!!!! Please thank the ladies for the great handy work!!!!! Please have all those around you, including yourself, say a prayer for me, Abraham Ramirez!!!! I am reading your book "Kisses from Katie" and I love it and have been telling everyone about it. What an inspiration you are. God's love shines through you. You are such a motivation to me to get up and make the world a better place for all, or one. YOU ALL BEAUTIFUL CHILDREN OF GOD. I LOVED RECEIVING YOUR BOOK AS A GIFT AS I TO HAVE DREAMED OF SERVING GOD IN AFRICA. YOU STORY INSPIRED ME. HOW MANY CHILDREN HAVE YOU ADOPTED AS OF CURRENT DATE? IPRAY IF IT BE GODS WILL I WILL MEET YOU AND ALL YOUR BEAUTIFUL CHILDREN ONE DAY. I just read your book and I had already been praying about if God wanted me to be a missionary in Uganda and after reading your book it really showed me where he wanted me to go. I'm only 15 so I can't really move to Africa now, but I know when he is ready for me to go, I'll go. Thank you for being an inspiration and I pray that God continues to work through you and everything you do. My teacher read excerpts from your book and I started to cry. I am not a very sentimental person but when I listened to your meaningful words I couldn't help but tear up a bit. Thanks for all you do with those kids and thank you from my whole class. Katie, My name is Kennedey Moffet. I am almost finished with your book and I am so inspired. I go to a Catholic High school and have wanted to do missionary work for a while now. When I learned about your past and the life you are living now I felt like God was calling me to do the same. Your story is amazingly beautiful and inspiring. I would like to know how you got started in Uganda and how you found out about the opportunity to fly over there to help? I am so willing to follow in your footsteps to see if God is calling me to do the same.I would love to hear back from you. May God be with you, always. I'm so sorry for the sins committed against your girl. And so thankful that God has drawn her to Him and given her a mother to love and protect her. We're so lucky to have God on our side. Hi katie, you are my hero! i read you book, and love it. hi my name is Ruth and I am 11 years old and I live in the small town of Wilmore, Kentucky. you have inspired me so much! I am halfway through your book and just asked my mom if she could look for out of the country mission trips for my age and she said she would think about it. but I really have always had a passion for teaching children the gospel. I pray the King of the universe guides your every move as you face each day with courage. Hi Katie, I have just read your book. Wow it touched my heart. I could not put your book down. You are an inspiration. and just reminds us all of how much God loves us. And is always there for us no matter what. Love to you and your family Katie. Katie, I have read your book 5 times and I love to read it over and over again. It brought me tears a lot and excitement in my heart every time i read it. I am so inspired by your life testimony and your heart. Some of the story you tell in the books, I can relate so much because it was the same feelings and thoughts that I have during those times that I am living alone in a foreign land and follow Gods leading and leave everything behind. You are such an inspiration. Keep up the faith. Hi Katie, I have just read your book and decided to look up the website. What a joy it was to see the photo posted in Decembr 2013 of you and your daughters. They are all so lovely..you certainly have your hands full! I know God blesses you abundantly and will continue to give you wisdom, patience and strength to parent these beautiful young women. They (and their Mum) are such shining lights for Jesus in their community. Dear Katie, thank you for writing your book and opening my eyes to what I can do for God right here where I am. May you continue to be blessed with your family. Yes Jesus loves you and he loves me and He loves us all unconditionally. Let us all remember that all are God's precious children.